PPM's very own berry box guide. 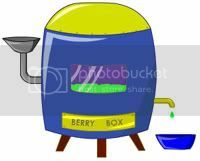 Learning to use the Berry Box Below you�ll see pictures of flowers and food (strength items) showing Calories, Weight and Density. All the numbers you see are a very important key in making the Berry Box work. You�ll need 1 flower and at least 1 food to make a berry combination. First off check your pets Strength. If you start putting combinations together without checking current Strength first chances are your formula will be a failure. You need to add up the Calories for each item used. This MUST BE higher than your pet�s current strength. Once you have this figured out you will then add the Weight and Density of ALL ITEMS USED. This will be the Temperature that you set the Berry Box at. Always double check your addition, the items that you have checked off to use and the pet you are going to use this on. The Berry Box is a very complicated machine. The CALORIES of all items combined has to be greater than your pet's strength. The TEMPERATURE has to be equal to the total weight + the total density of all items you enter. You CANNOT enter more than one item with the same caloric value. You can use the berry box once every 10 hours. You can enter up to three (3) items. At least one has to be a strength increasing item, and at least one has to be a BERRY. Your pet has to have armor level 9 or higher. There are a few other SECRETS to make the Berry Box work even better. Can you figure them out? I�ve taken some of the guess work out for you but it�s always fun to play around and figure up your own combinations. Good luck and have fun!! !